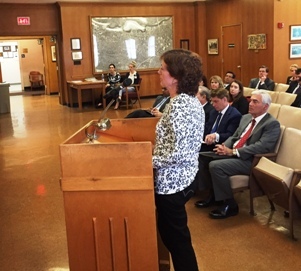 HPAE members testifed at two public hearings held yesterday to review the proposed merger of the Hackensack University Health Network and Meridian Health. 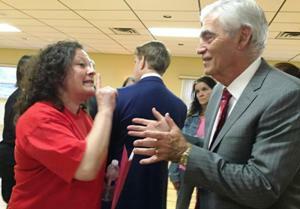 While supporting the pending merger of Hackensack and Meridian, they urged the New Jersey Attorney General to set conditions protecting the rights of health care workers and the community’s access to health care services. 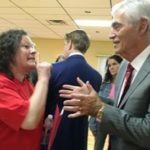 Assuming the merger is approved by the state, four HPAE locals will represent a total of 2300 RNs and other health care workers at four facilities in the merged system: Jersey University Medical Center, Southern Ocean Medical Center, Palisades Medical Center, and The Harborge, a nursing home. A fifth HPAE local also has a connection with the merged system. HPAE Local 5004 represents RNs at Englewood Hospital and Medical Center. The medical center is not currently part of the merged system, but does have a clinical and academic affiliation with Hackensack. testimony, Local 5058 President Kendra McCann asked Meridian’s CEO John Lloyd to commit to honoring the contracts of the HPAE locals in the merged system. Lloyd agreed to do so for the Meridian locals (Jersey Shore and Southern Ocean) and to put that commitment in writing. In addition to HPAE, members of the New Jersey Organizing Project were present at the Neptune hearing. 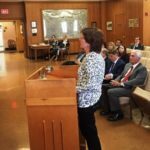 A representative of the group testified about the absence of mental health services in the area after Hurricane Sandy and the continued need for care.